The state capital of New York, Albany is not your typical tourist draw. However, book best cheap flights to Albany to view the several centuries-worth of architecture that the city is a living testament to. Interestingly, the city was a smuggling hub for Canadian alcohol during the prohibition era, and has been featured in several novels and plays by Albany native and prolific author – William Kennedy. Albany isn’t your typical go-to if you’re looking for a more action-packed holiday. However, the city still serves up an interesting mix of art, gastronomy and, of course, its signature architecture, which make it a great place to unwind with the entire family. Further, here are some of our top reasons for you to take that next low cost flights to Albany. Albany City Hall – The beautiful brownstone structure has been designed by renowned architect H.H. Richardson in the Romanesque style and is widely considered the most beautiful in America. While here, look out for the Albany Carillon, which was built to commemorate the soldiers who lost their lives to World War I. Concert season is an Albany highlight, and sees many notable carillonneurs from around the world perform at Albany City Hall. Make sure to keep this in mind when booking your cheap plane ticket to Albany. 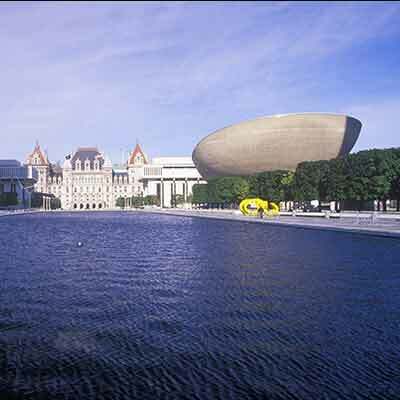 Empire State Plaza – Yet another outstanding architectural masterpiece, the Empire State Plaza is a sight to behold. The plaza also serves as a venue for several free musical performances, ranging from Blues festivals to rock concerts. If you happen to be in Albany around the Fourth of July, don’t miss the spectacular display of fireworks. Washington Park – Albany’s strong arts scene is not just confined to theatres and auditoriums but is best experienced in open air surroundings, such as at the playhouse at Washington Park. Summers see a variety of musicals and plays hosted at the playhouse, while the onset of May brings with it the stunning Tulip Festival. Book cheap airline tickets to Albany early to experience this breathtaking summertime park action. Capital District Scottish Games – Albany celebrates its Scottish heritage over Labor Day weekend, as the sounds of bagpipes and drumbeats fill the air. This is a time for much merriment and feasting on Scottish delights, viewing an impressive horse exhibition and dressing up in fashionable Scottish garb. Book your last minute flights to Albany towards the end of summer, to experience and participate in this festival. A trip to Albany is a great way to explore the quieter side of New York, especially if you’re looking to unwind with the entire family or seeking a quick getaway. For the best Albany flight deals and cheap domestic flights, head right to Lookupfare’s website or app. The easy interface and variety of options make browsing through last minute flight deals simpler and more effortless than ever before.